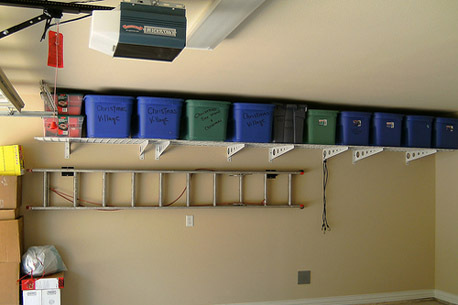 Add Wall Shelving to your Garage for those often needed items. 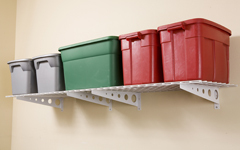 The Pro Series 2x8ft Wall Shelf and 15x45 inch adds additional storage space to your walls. These heavy duty durable designed units are stronger then any shelf you can buy at your local hardware store. 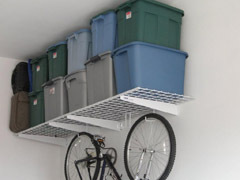 Great for storing tote bins. Add a few hooks to the bottom and you can hang a bike from them. 3° of incline from the base of the shelf to the tip. 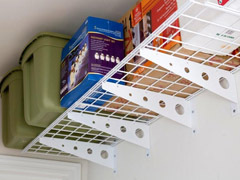 Low profile brackets for increased storage area. Portable. Can take with you when moving. Connect multiple units to maximize space. Powder coated brackets and shelf. Can be installed on finished or unfinished walls.